The film making of Mamma Mia in Skiathos Greece, Sporades: The beautiful island of Skiathos Greece with its pine forests and blue flag beaches is a very popular destination for a picture perfect vacation. But the filming of Hollywood movie Mamma Mia is definitely set to open up its wonderful sights to the world. The film Mamma Mia was filmed in Skiathos and also Skopelos islands in 2007. It is the movie adaptation of the hit West End musical stage show of the same name which has been running house full in London and Broadway. The star line up of the film who were in Skiathos for the shoot includes Meryl Streep, Amanda Seyfried, Pierce Brosnan, Colin Firth and Stellan Skarsgard. Shooting for the film were held at Skiathos harbor near Bourtzi on August 2007. The main climax scene of the movie was shot in the closed sets at the bell tower, with the beautiful sets of a wedding on the island. The shooting at the harbor was a public event with lots of tourists gathering to get a glimpse of the stars, while many locals were invited to play the roles of extras. The movie has hilarious scenes of a taxi chase between Brosnan and Firth, shot with cameras mounted on cranes as well as quad bikes. They passed through the narrow alleys of the port with the old local cabs playing a major role. The whole day was active at the usually peaceful port had been given a makeover with the sets imitating the 1970s. An overloaded Caique (ferry boat) was shot with cameras on speed boats as it entered the port to enact the scene after the chase where the actors make a run for the ferry. Pierce Brosnan was much in need for photos and autographs among the tourists in town. The title of the show derived from the song Mamma Mia by ABBA, whose tunes are used throughout the film. 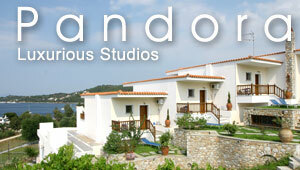 The cinematographic excellence really shows with the awesome presentation of the sights around Skiathos.